Vault is the connection between KO PUNCHLIST and the outside world and a temporary holding place for data. Trasfer of data between the outside world, the Vault, and the KO PUNCHLIST projects is very manual and controlled. Vault is a method to bring in reference items and large files into an active project from a variety of soures like itunes email, computer or tablet device, or any of KO PUNCHLIST’s compatible Online Storage Utilities. When the user imports a file to Vault it is not automatically saved or referenced in the active punchlist, and when the user saves a file from the active punchlist to the Vault the file remains in the Vault until the user copies or moves it to another place of storage. What is the difference between App Vault and Project Library? Project Library is a permanent storage space for graphic data and can be printed as an ancillary report or “Index of Referenced Graphics” for the associated punchlist project. Each active punchlist in the KO PUNCHLIST app has its own designated Library. The Project Library stores thumbnails of images and PDFs and the line items associated with the images and PDFs are diplayed numerically along on the right-hand side of the thumbnail. Because Project Library is project specific, graphic files from one project will never get mixed up between projects even if the user has multiple active projects. Will deleting files from the Vault affect the punchlist projects? Deleting a PDF from the App Vault does not delete the PDF from the project(s) in which it is being used. App Vault and Project Library are two distinct and independent data holding places. For better understanding review Difference between App Vault and Project Library. If I import a new PDF with the same file name as an existing PDF in my punchlist what happens? Uploading two different PDFs with the exact same name more than once into the App Vault overwrites the original PDF file in the App Vault, however has no effect on the original PDF in the Project Library because App Vault and Project Library are independent from one another. For better understanding review the differences between App Vault and Project Library. If a user uploads two different PDFs with the exact same name more than once into one Project, the result is two distinct PDFs in the Project Library, one of which aquires a numerical value in the file name to differentiate the titles. Pins do not automatically transfer from an old PDF to a new PDF. Does data in a hidden column or subject export? Hiding columns or subjects does not delete data and data will export with the rest of the project when the punchlist file is shared. Why can't I see my files in Dropbox? Each compatible Online Storage Utility has its own distinct Application Programming Interface (or API). Dropbox’s API does not allow the users to access folders within folders during an import process through KO PUNCHLIST. Only the files in the topmost folder of Dropbox can be accessed. 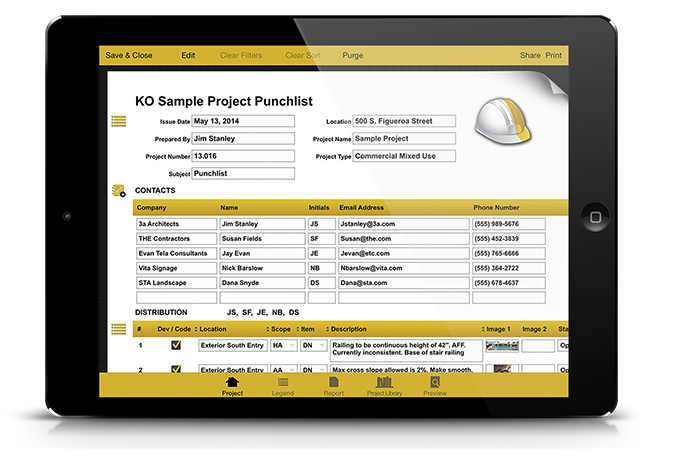 With the KO Punchlist App you can easily create an interactive, professional, and fully functional punch list with integrated media and specifications from your fingertips.